Sometimes they get ruined by outside elements. Sometimes they become stale and boring. And sometimes you just plain outgrow them. No, we aren’t talking about sour relationships, we’re talking about t-shirts! Everybody has a few; those three or four shirts, hanging out at the bottom of your dresser drawer, just waiting for a chance to see the light of day again. Well, sorry over-sized Spitfire tees and baggy neon tank-tops, you’ve gone the way of bleached hair tips and JNCO jeans. It’s time to visit the great Gadzooks in the sky. 1. Throw it in a volcano. BOOM! That’s how you start a list! 2. Wear it in a pie-eating contest. Entering a pie-eating contest (or anything-eating contest, really) and leaving with a clean shirt is like going to a pet store and not petting everything with fur. Why even bother? You know what would make that really terrible shirt you hate so much better? Throwing it in a hot, steamy pile of trash, filled with your used coffee grounds, egg shells, moldy fruits and veggies, and if you’re extra weird, toenail clippings and hair (yes, that’s a thing — we checked), and making compost fertilizer out of it. Who knows, maybe you could use it to grow a less terrible shirt! 4. Melt it into oblivion with science. Mix appropriate parts sulfuric acid and hydrogen peroxide together and you’ll get to watch a wonderful garment of clothing turn into a wonderful pile of mush, like that one time in Breaking Bad. Hooray science! 5. Curse it into oblivion with ancient magic. Shrunken heads, mystical spells, and devastating curses. If you really want to ruin a good shirt’s future, find yourself a witch doctor and lay down the law. Hooray magic! These guys look legit. Via. 6. Hit it with a laser beam. A la James Bond in Goldfinger. 7. Put it on a dog — any dog. Because they’ll tear it right off and eat it — trust us. 8. Wrap it around a block of sodium and throw it in a lake. Chemistry is terrifying. Mix sodium with chloride and you get common table salt. But mix sodium with water (H2O) and you have a recipe for a pretty awesome explosion. Wrap a shirt around a block of sodium, give it a good toss in the lake, and let the fun begin. Just be sure to wear gloves! 9. Take it to one of these guys’ concerts. Take grotesque Sci-Fi costume pageantry and sprinkle it with a dash of thrash metal, and what do you get? 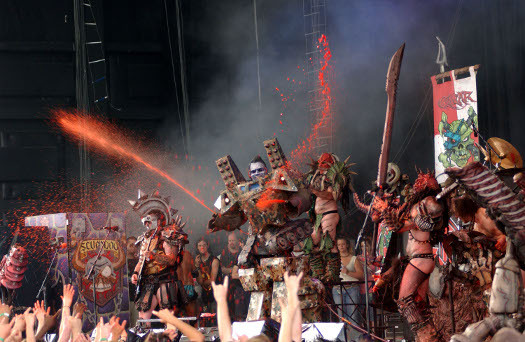 The intergalactic space warriors also known as Gwar — and, like chemistry, they’re terrifying. This band mixes interesting and plot-heavy dialogue, metal music, and over-the-top live theatrics into a cocktail mixer, shakes it around, and then sprays it all over their audience in the form of gallons upon gallons of faux blood, toxic waste, and other ambiguous fluids — and everyone loves it. If you want to ruin a shirt (and everything else you’re wearing), this is the way to do it. … Blood cannon? Where do we sign up?! Via. 11. Give your car a tuneup with it. Why waste expensive paper towels to check your oil when you can turn a totally awful shirt into a few totally lovely shop rags? 12. Tie it around a hydrogen-filled balloon and then poke it with a long, flaming stick. 13. Challenge a cowboy to a gunfight in it. You’ll probably end up as dead as your shirt, but hey, it’s called “commitment,” OK? 14. Use it as a “Capote” in a bull fight. Or just throw it at the bull and run away. Bonus points for shrill screams upon departure. 15. Wear it while eating spaghetti. Or tacos. Or buffalo wings. He knows what we’re talking about. Via. 16. Eat a pastrami sandwich and then go on any of these. This is too heinous even for us to imagine. 17. Gift it to a zombie. Zombies are clumsy, unhygienic, and some of the messiest eaters of all time — ranking second only to babies. In honor of AMC’s The Walking Dead returning to T.V. this week, we figured a spot on our list was more than appropriate. 18. Throw it in the trash. Because Oscar the Grouch can’t go shopping. No wonder why he’s always so grouchy. Via. 19. Lay it over a puddle for a lady. 20. Use it as a diaper. The result is as catastrophic as throwing it in a volcano. Don’t let that cute mustache fool you. He’ll ruin every shirt you own — even the good ones! 21. Wrap it in bacon, dip it in honey, and tie it to a tree in the middle of the woods. Or package it up and ship it out to us, because that actually sounds delicious. If a bear doesn’t find it, we’ll gladly take that tasty problem off your hands. 22. Give it to Hulk Hogan and watch magic happen. Fact: This guy kept entire t-shirt companies in business throughout the 1980’s and 90’s. 23. Get yourself a nice, hot cup of coffee and go for a drive in stop-and-go traffic. At this point, I should probably start wearing a raincoat to work.